Provide comfort for the family of Donna Needham with a meaningful gesture of sympathy. Donna M. “Bonazelli Burnham” Needham, 68, of Torrington, died on Friday, January 4, 2019 due to injuries sustained in a house fire, along with her beloved husband, John Needham. She was born February 22, 1950 in Hartford, daughter of the late William F. and Helena F. (Ruttgers) Bonazelli and had lived in Avon and Canton prior to moving to Torrington 13 years ago. Donna was a graduate of Northwest Community College, having received her Library Science Associate’s Degree. She was a member of the Avon Fire Department Women’s Auxiliary and volunteered for the House of Bread. Having been a local Antique Dealer for many years, she enjoyed going to flea markets and tag sales. Donna also loved games, especially scrabble, backgammon, cribbage and setback. She also enjoyed instant lottery tickets, a good mystery and the history of the Farmington Valley. 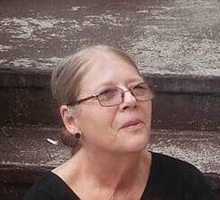 She is survived by her children, Dawn White, Stephen White and John Burnham; her step-sons, Tony and Tim Needham; her sister, Deb Brodeur and her husband John Jarzbek; her brothers, Will and Jason Bonazelli; her brothers-in-law, Rollin and Paul Needham; her grandchildren, Jamell, Reggie, Jessica, Steve, Cayla and Jakob, as well as seven great grandchildren and several nieces and nephews. A Memorial Service will be held at Saint Matthew Lutheran Church at 224 Lovely Street, Avon on Saturday January 19, 2019 at 11:00 am, with a church reception to follow. Memorial donations may be made to House of Bread, 1453 Main Street, Hartford, CT 06120. Please visit Donna’s Book of Memories at www.vincentfuneralhome.com for online tributes. Provide comfort for the family of Donna Needham by sending flowers. Sending love and prayers during this very difficult time to the entire family. I was so very sad to hear of the tragic loss of Donna and John today.